Forearm Fractures in children account for approximately 25 percent of all pediatric fractures in the U.S.In children vitamin D deficiency causes bone tenderness, dental deformities, impaired growth, increased bone fractures, muscle cramps, short stature, and skeletal deformities such as rickets.Dr.Pooya Hosseinzadeh with his colleagues conducted a study to find out the link between low vitamin D levels and the severity of fractures in children.They found that children who are vitamin D deficient have a greater risk of having more severe forearm fractures requiring surgical treatment.The findings of the new study have been presented at the 2018 Annual Meeting of the American Academy of Orthopaedic Surgeons (AAOS). In this study, 100 children (ages 3 to 15; 65 percent male, 35 percent female) with low-energy forearm fractures were prospectively enrolled. Each participant filled out a questionnaire focusing on risk factors for vitamin D deficiency. The mean 25-hydroxyvitamin D (25[OH]D) concentration was 27.5 + 8.3 ng/ml. 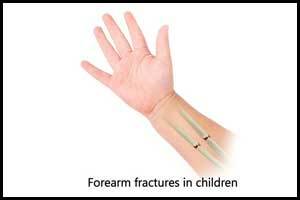 The fractures were then categorized as requiring non-operative or operative management. The children’s vitamin D status was based on measurement of 25(OH)D concentration obtained during the clinic visit, and was compared between the two fracture groups. Using Endocrine Society guidelines, 21 percent of patients were vitamin D deficient (25(OH)D < 20 ng/ml) and 49 percent had vitamin D insufficiency (25(OH)D: 21 – 29 ng/ml). There was a dramatic difference in incidence rates of vitamin D deficiency between those treated surgically (50 percent) compared to those in the non-operative group (17 percent). Being vitamin D deficient was also associated with a greater risk of needing operative management (28.6 percent versus 7.6 percent non-operative). Being overweight/obese and nonwhite increased the likelihood of vitamin D deficiency. Seventy-five percent of children in the operative group were obese or overweight, compared to only 32 percent of children in the non-operative group. Patients requiring operative management were older than 10 years of age and had greater BMI than patients not requiring surgery.